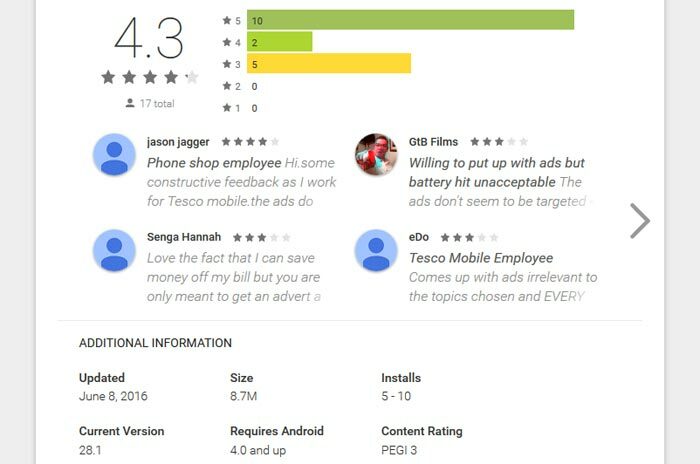 While a rival UK mobile operator is trialling complete network-level ad-removal for its customers, Tesco is asking if its customers would like to opt in to view more ads. The Tesco Xtras app presents users with "ads, offers and content" when they unlock their phones. In return for that time/patience/battery life, Tesco will cut monthly contract bills by £3. So, how do you get £3 off your monthly bill? Tesco says that you must install and enable the app linked to at the Google Play Store above. Once installed, you sign in with an email or your Facebook account. You are then asked to tell the app some preferences so that you get advertising and offers that are relevant to your interests. After that time, with the app active, you start earning credit for your bill reduction. Tesco says that "every few times you unlock your phone you'll see relevant ads, offers and content". Don't worry, there won't be any video-based promotional screens. You can click the ad/offer to learn more, close the ad with the upper right 'X' icon, and some offers will be able to be saved for later with a heart icon. Unfortunately, according to Tesco's FAQ, the Xtras app "uses about 4% of your full battery charge". but the review comments and average review score aren't terrible. Do you think that Tesco is asking too much for too slight a discount? Remember you can get Tesco contract phones such as the Lumia 550, or Moto E 2nd gen, with 250 minutes, 5000 texts and 500MB (+200MB bonus) data for just £7.50 per month. In such a case £3 off is a significant slice. While I think its perhaps a nice option for those who would rather trim off a bit of the bill, even if I were with Tesco I would rather have to deal with £3 more than ads whenever I unlock the phone. I guess its a fairly reasonable slice of the bill off though, but quite how much its worth is going to come down to how much you use the phone. Every time you unlock your phone, you would be costing yourself time. Had enough of ads already. just want a good service with no intrusions. It's not every time, it's every few times (or third time I read somewhere else). That's not bad for a significant per month discount. There's two ways to look at that, one of which is that £3 is a good ‘slice’ of, for example, £7.50. But the other is that £7.50 isn't expensive and are you prepared to put up with adverts for £3/month. - if my provider offered it, no way would I put up with ad's for £3/month. I will say the way they're offering it, in effectively opt-in for people willing to put up with the ads, is the right way to go about it, and no doubt it will appeal to some people. Meh, it's not for everyone but I'm sure some people would appreciate the chance to lower their bills a little.